Old Car Memories > Muscle Cars > 1982 & 1984 (L83) 5.7 Liter Cross-Fire Injection V8 – Love It or Hate It? If you were a performance gearhead who came of age during the 1980s, you’ll certainly remember Chevrolet’s Cross-Fire Fuel Injection V8s. These were motors that have received their share of barbs and ridicule – unfairly I might add. A common name back in the day that was jokingly attributed to these motors was "Cease-Fire". The image problem for this motor wasn’t reliability issues like the Oldsmobile Diesel V8s of this era were well known for having. The issue was two-fold, first Cross-Fire was replaced with Tuned Port Injection which produced considerable more horsepower and torque. Second the Cross-Fire system was very difficult to modify to increase horsepower and torque – in other words, when you bought a car with this engine you were stuck with a bone stock motor for the duration of your car ownership whether you liked it or not. For 1982 and 1984, the 5.7 liter (350 CID) Cross-Fire Fuel Injection V8 was the only motor found under the hood of the Chevrolet Corvette. Chevrolet would give this engine the RPO code of L83. It seemed to make sense since from 1975 until 1980 the L82 4-bbl 350 CID V8 which was rated at between 205 to 230 horsepower (from 1975-1980) was the Corvette’s high-performance motor option. Unfortunately by 1981, the OBD I on-board computer was now mandated so the carburetor was computer controlled. The Environmental Protection Agency’s (EPA’s) Corporate Average Fuel Economy (CAFE) standards were kicking into high gear by 1981, so fuel efficiency was the name of the game. Also, the EPA’s emissions standards were tightening and it caused the 1981 Corvette to be equipped with a computer controlled 4-bbl carburetor resting on top of the new L81 350 CID V8 which produced 190 horsepower. This was 40 horsepower less than the previous year’s L82 V8. The new strict emissions standards forced Chevrolet to drop the 4-speed manual transmission option for 1981. You can imagine the heartache this must have caused for most Corvette fans who always had a manual transmission option available except for the early first generation Corvette which had a mandatory 2-speed Powerglide automatic transmission. Everyone was wondering how far things were going to fall after the 1981 model year. Most American V8 powered performance cars were gone by 1981, so it was not beyond the realm of possibility that the Corvette was nearing extinction. These were very scary times for performance car fans. Chevrolet saw the writing on the wall, and realized with the upcoming emissions and CAFE standards a 4-bbl 350 CID V8 was not going to cut it. So the only alternative was fuel injection. Problem with fuel injection, was that wasn’t very reliable at the time. Cadillac had some success with an port type fuel injection (with a fuel rail for each bank of cylinders) attached to an Oldsmoile 350 CID V8 for the 1976 Cadillac Seville. It was the first successful attempt at a computerized fuel injection system. The net output was 180 horsepower which was about 20 horsepower more than the 4-bbl equipped Oldsmobile 350 V8. Fuel rail type fuel injection systems were very expensive at the time, since a fuel injector was needed for every cylinder. GM moved away temporarily from this design – it was only really economically viable on the Cadillac Seville which was one of the most expensive American cars available during this time, so having a costly fuel injection system wasn’t such a big deal. GM then back pedaled and decided the way to bring fuel injection to the masses was in the form of Throttle Body Fuel Injection (TBI). This was a less complex system in which the carburetor was replaced with a throttle body unit with one or two fuel injectors. Everything needed for the fuel injection to work was contained within the throttle body just like everything for a carburetor to work had been contained within a carburetor. The plus side of TBI compared to the carburetor was that the idle and fuel mixture could be more precisely managed, this gave the engine better driveability especially on cold days where a carburetor would need a generous warm-up period before the car could hit the road. Another result from the precise idle and fuel management of the TBI system was that better fuel economy could be achieved – this was very important when every little mpg gain matter in the quest to keeping a given car CAFE compliant. For 1982, even Cadillac used a TBI system with the release of its all new aluminum (HT4100) 4.1 liter V8. Chevrolet was also onboard with the move forward to TBI. To its credit when it realized 4-bbl equipped small-block 5.0 liter (305 CID) and 5.7 liter V8s were on borrowed time, it decided a TBI version of these two small-block V8s would be just the ticket for the future Corvette and Chevrolet Camaro. For the 1982 model year, it was decided the 5.7 liter V8 would be reserved for the more upscale Corvette and the Camaro would have the 5.7 liter V8 replaced on its top performance model (the Z28) with a 5.0 liter V8. Since both the 5.7 and 5.0 liter V8s were part of Chevrolet’s small-block V8 family, they had the ability to interchange parts. Chevrolet decided the 1982 Corvette would come standard with TBI equipped 5.7 liter V8 and the Camaro Z28 would have as its optional engine, a TBI 5.0 liter V8. All of this sounded good. Except at this time most automakers who dabbled in fuel injection tended to have reliability issues. For instance Chrysler had its first foray in fuel injection for 1981 with the return of the Imperial where it mated a TBI to its ultra-reliable 318 CID V8. The result should have been a marriage made in heaven but was nothing short of a disaster. 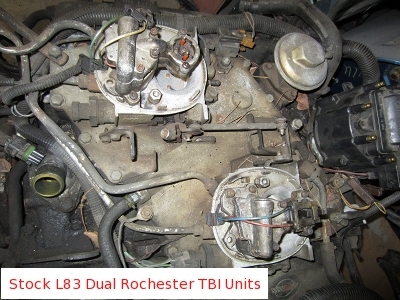 Imperial owners were so frustrated with the continued problems, Chrysler dealers swapped out the computer controlled TBI with a 2-bbl or 4-bbl carburetor. This issue alone killed Imperial sales and ensured the Imperial only lasted for three model years. So you can see, how if Chevrolet messed up with its release of a TBI system, it could have been curtains for the Corvette and possibly the Camaro. Once word got out of poor reliability issues plaguing a car, soon thereafter that car’s run was usually very short. Chevrolet engine engineers came up with a brilliant idea when developing TBI for the 1982 Corvette. They decided to harken back to the racing spec design of the legendary small-block 302 CID V8 which powered the first generation Camaro Z28. It was a motor that was designed to do battle with in the SCCA racing circuit. In stock form it had a 4-bbl carburetor, in race form it was given a free-flow Cross-Ram intake manifold with dual 4-bbl carburetors. This setup was lethal on the track, it could rev to the moon and provide loads of horsepower exactly where it was needed on the track. For 1982 Chevrolet engineers had an option of using a traditional intake manifold and placing a single TBI (with two injectors) on top. However they decided instead to use two smaller TBIs units (with only one injector in each) that were paced on each side of the an aluminum intake manifold – a setup that was a dead ringer of the legendary 302 Cross-Ram. 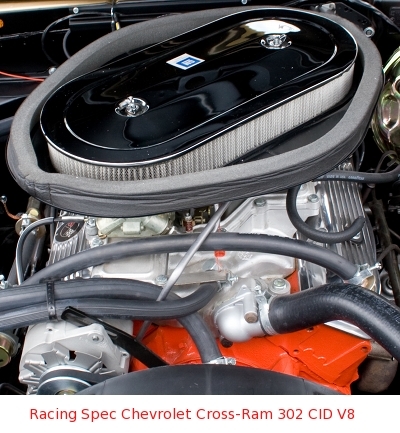 Chevrolet even went that extra mile placing on top of the engine a flat black oval air cleaner assembly which housed two mini round air filters (very similar to the original Cross-Ram). On the top of this oval air cleaner assembly was a "Cross-Fire Injection" call out. 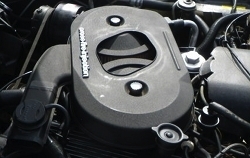 The decorative black valve covers were taken from the L82 V8. The engine block was painted in GM Corporate Engine Blue which would be the last year GM motors would get this color, for the 1983 model year all GM engines would be painted black which is the engine color still used today on all new GM engines. If you looked over the spec sheet for the 1982 5.7 liter Cross-Fire V8, this motor appeared to be a very high-performance V8 – it had a 9.0:1 compression ratio. The previous year’s L81 only had a compression ratio of 8.2:1. The L83 had a high-performance camshaft which had a lobe lift of .269 inches (intake)/.276 inches (exhaust), valve lift of .403 (intake)/.415 (exhaust), a duration of 202 degrees (intake)/206 degrees (exhaust), and a lobe displacement angle of 115 degrees. 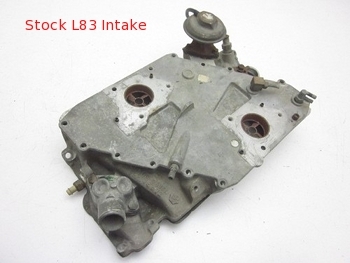 The L83 also had performance oriented cast iron heads (#462624) with a chamber volume of 76cc, intake valve size of 1.94 inches, exhaust valve size of 1.50 inches, and an intake port volume of 158cc. The 5.7 liter V8 engine block had 2-bolt mains. 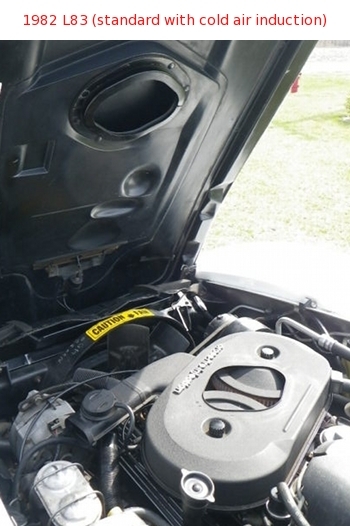 The 1982 L83 had the added benefit of cold air induction – a solenoid activated flap opened up on the underside of the front of the hood which allowed cool air (from just in front of the radiator) to be diverted to the middle of the top of the Cross-Fire air filter assembly. There was a rubber seal on the underside of the hood which when closed sealed the air cleaner assembly to the hood to ensure that no cool air escaped. The flap opened as wide-open throttle was approached providing not only cool air but a nice roaring moan that reminded occupants of the original muscle car era. The TBIs found on the L83 were 48mm Rochester units – they had a combined 750 cfm maximum flow rate. On the surface this sounded good, unfortunately that was not the complete picture. 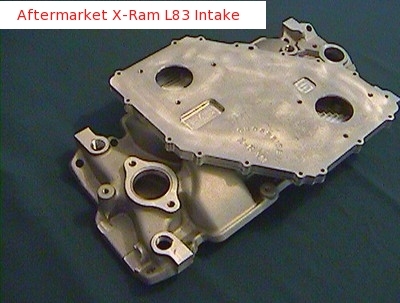 Chevrolet engineers heavily restricted the L83’s intake manifold, so much so, that only 475 cfm was the max flow rate. The first culprit was very small intake ports which were at least 35% smaller than the cylinder head ports. The second was the restrictive intake runners which Chevrolet used to improve fuel efficiency. The end result was an advertised power output rating of 200 horsepower and 285 lb-ft of torque (10 horsepower and 5 lb-ft of torque more than the 1981 Corvette’s L81). This output was very good for the times, but horsepower and torque could have been much more had the factory intake flowed at least 750 cfm (instead of a paltry 475 cfm). What in essence Chevrolet had done was offer a high-performance setup with an intake that flowed like a run-of-the-mill 2-bbl intake. Never-the-less the 5.7 liter Cross-Fire equipped 1982 Corvette was still the fastest new American car available for the 1982 model year. The 1982 Corvette went 0-60 mph in 8.1 seconds and the quarter-mile in 15.9 seconds at 86 mph. Performance was also hampered due to a 4-speed automatic transmission being mandatory on the 1982 Corvette – a manual transmission would have yielded better performance numbers. The 1983 model year would have been the first year of the fourth generation (C4) Corvette. However the C4’s rollout was delayed until the middle of the 1983 model year, so Chevrolet decided to skip the 1983 model year for the Corvette and released the all-new C4 Corvette as a 1984 Corvette. The L83 V8 was carried over from the 1982 Corvette to the 1984 Corvette unchanged except for a few cosmetic upgrades. The valve covers and air cleaner assembly were now colored silvery gray and made out of magnesium which was more in line with the new space-age styling of the C4. It gave the engine a more modern look – it had lost its Cross-Ram visage. Cold air induction was still there however there were now flaps on both sides of the new square air cleaner assembly, that connected to the underside of the C4’s clam shell hood. Ironically this would be the last year a selonoid driven flap type cold air induction system was available on a Corvette. Even though all the engine internals and other parts were the same as the 1982 L83, output increased to 205 horsepower and 290 lb-ft of torque. The reason for the output increase was the 1984 Corvette was the recipient of an improved exhaust system. The 1984 Corvette was the fastest American production car for 1984 – it wasn’t by much but it still received the title. A 4-speed automatic transmission was standard for 1984 and early in the model year the only transmission available. As the 1984 model year progressed Chevrolet released the EPA friendly Doug Nash 4+3 manual transmission (a 4-speed manual transmission that had an overdrive gear for the top three gears). For 1985, Chevrolet replaced the Cross-Fire system with a new Tuned-Port Injection (TPI), a fancy way of saying port type fuel injection, on the Corvette’s 5.7 liter V8 thus changing the RPO code to L98. Horsepower rose to 230 and torque jumped to 330 lb-ft. And Corvette fans were really loving the new L98 Corvette’s 0-60 mph in 5.7 seconds and quarter-mile in 14.4 seconds at 95 mph. Thus Cross-Fire was thrown into the waste basket of automotive history, forgotten by many and hated by some. The 1983 model year was the last year of the 5.0 liter Cross-Fire V8 engine option for GM’s F-bodies. For many years this is where the story ended. However where the L98 TPI V8 wasn’t crippled or hampered in any way, the L83 had been forced to limp when it could have run. Would you believe that the L83 could out perform the L98, if it hadn’t been crippled with a restrictive intake? The truth is if the L83 would have been given a non-restrictive intake manifold it would have beat the L98 in both the 0-60 mph and quarter-mile runs. Think I am pulling your leg? Performance Plus Systems (now a defunct company), released an aftermarket free-flow Cross-Fire intake, called the X-Ram for the L83. On the outside the X-Ram looked exactly like the L83’s stock intake however inside it had a flow rate of 1440 cfm versus the stock intakes’s 475 cfm. Performance Plus Systems tested a bone stock L83 powered 1984 Corvette and obtained a quarter-mile of 15.6 seconds at 86 mph which was exactly what many of the automobile magazines obtained when testing the 1984 Corvette back in the day. Performance Plus Systems then made no other modifications to this Corvette except for replacing the stock intake with their X-Ram. The result of the change yielded a 14.3 second at 97 mph hour quarter-mile time which was faster than the L98’s time. This can’t be emphasized enough how just removing the crippled stock intake with a free-flow intake (which should have been installed from the factory) dropped the quarter-mile time by 1.3 seconds and increased the trap speed by 11 mph. This is an incredible infusion of power. With performance like this, the X-Ram equipped 1984 Corvette produced around 260 horsepower (the L98 never produced more than 245 horsepower). There’s no doubt the L83 would have performance-wise trounced the L98. It only proved that Chevrolet engineers had indeed done their homework and the L83 using the small-block 302’s Cross-Ram type of induction system was a sound decision. The problem was the massively restricted intake. Everything was setup correctly on the L83 except for the intake, had Chevrolet engineers had the stock intake flow as it should have, the 1982 and 1984 Corvettes would have been serious performance forces to be reckoned with. Unfortunately, the L83 will be viewed by automobile historians as merely a stop gap measure implemented by Chevrolet until the 5.7 liter TPI V8 was ready for production. 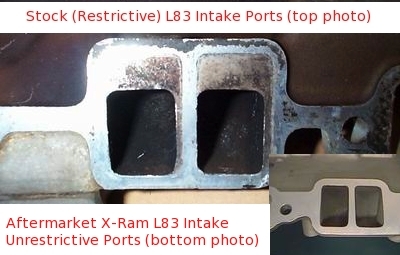 Even if Chevrolet had used a free-flow intake on the L83, the L98 still would have replaced it since port injection is more fuel efficient than a TBI system. 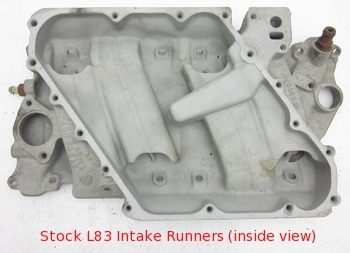 However Corvette fans would have been singing the blues when TPI arrived instead of celebrating its arrival, if the the L83 had a free-flow intake manifold. Enough of the revisionist history approach, even with the restrictive intake the L83 got the job done and it still managed to keep the Corvette at the top dog spot among American performance cars. So judged in the context of the 1982 to 1984 American performance car offerings, the L83 was the best new American performance motor you were going to find during this period – perhaps automobile historians will remember that.